For most people in the county the Spotted Flycatcher is effectively extinct as a local breeding bird, as the map shows an obviously south-easterly distribution, with only a handful of records in the most densely-populated four northern boroughs of Wirral, Ellesmere Port and Neston, Halton and Warrington, and birds avoiding the urban areas of Northwich, Macclesfield and Crewe. Birds were found in only half as many Cheshire and Wirral tetrads as in the First Atlas, and confirmed breeding in only 101 compared with 267 twenty years ago. This is all part of the national decline in the species, whose population index has been in freefall since quantitative national recording started in the mid-1960s, dropping by 75% in the twenty years between our two Atlas periods. The decline is probably driven by low annual survival of first-year birds, in the period immediately after they leave the nest and/ or on migration and in their first winter (Freeman & Crick 2003); the widely-observed reduction in large flying insects cannot have helped. Despite being amongst our most confiding birds, Spotted Flycatchers are probably under-recorded. They arrive late – the main influx being in the second half of May – so their breeding activity peaks after that of all other passerines. Their song is weak, infrequent and not well-known, a discordant mixture of buzzing and kissing noises – Walter de la Mare’s ‘grey on grey post, this silent little bird’. So, most Spotted Flycatchers are detected by eye, not by ear. They draw attention to themselves by their characteristic method of feeding, unlike that of any other British species, flying out from a perch to catch a flying insect, usually returning to the same perch. When viewed carefully, however, the bird can be seen to be not ‘spotted’ and its scientific name, meaning streaked flycatcher, is much more appropriate. Spotted Flycatchers undergo one of the longest migrations of all summer visitors to Britain: the species winters from the Gulf of Guinea coast to South Africa and it is not known where our birds go within this broad range (Migration Atlas), although ringed individuals from northern Europe have been found in South Africa (Urban et al 1997). Spotted Flycatchers depend on exposed perches and adequate space to make their aerial sallies, thus avoiding open areas and dense woods, favouring areas with well-spaced mature deciduous trees. Habitat codes submitted in the Atlas showed that most birds were in human sites (42% of records) or broadleaved or mixed woodland (41%), with 15% in farmland. 87 of the 107 ‘human site’ records were rural, with villages and cemeteries favoured sites. They place their nests on ledges, and especially favour creeping vine or ivy against a tree or a wall; they take fairly open holes and crevices in trees, including occasionally open-fronted nest-boxes, and especially seem to like half-coconut shells placed in a suitable site, which save them time and effort in nest-building (Clarke 2005). Adult birds seldom feed far away from their nest – usually within 20 m or so – perhaps because they take only one item of food at a time back to their chicks, and a nearby feeding perch minimises their time taken and their energy expenditure. 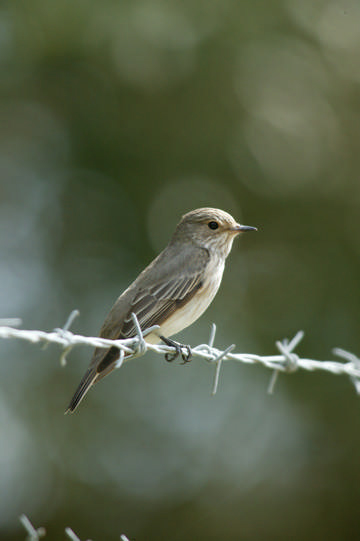 As a Red-listed species of conservation concern, the Spotted Flycatcher is now the subject of much study, mostly in its breeding areas. Birds breeding in gardens have much higher success than those elsewhere, with fewer nests predated and more chicks fledging, in better condition (heavier weights) (Stevens et al 2007). Despite Spotted Flycatchers’ reputation as pugnacious defenders of their nest – some birds attacking and driving off large predators – corvids, squirrels and cats nevertheless account for many nests. The flycatchers are persistent birds, however, and most will try twice, and many up to three times in a year in attempts to produce young: 3 or 4 chicks is an average brood, but later nests produce fewer young. The BTO analysis of Cheshire and Wirral BBS gives a county breeding season population in 2005 of 2,060 Spotted Flycatchers (with wide confidence intervals of 520 to 3,600). Especially with their liking for human habitation, there seems to be plenty of scope for active conservation measures to try to assist this species and attract it back to now-abandoned areas; the efforts of a team of amateurs in Worcestershire shows what can be done (Clarke 2005).